Triplet lens design for anastigmatic flat field suitable to complement the high image quality of the Hyperion Zoom. Converts every Hyperion Zoom into a 3.5 - 10.5mm high power Astro-Zoom eyepiece. Together with the T-2 adapter(included) the Hyperion-Zoom Barlow can likewise serve for any other projection application from 1.3 up to 6x magnification factor. 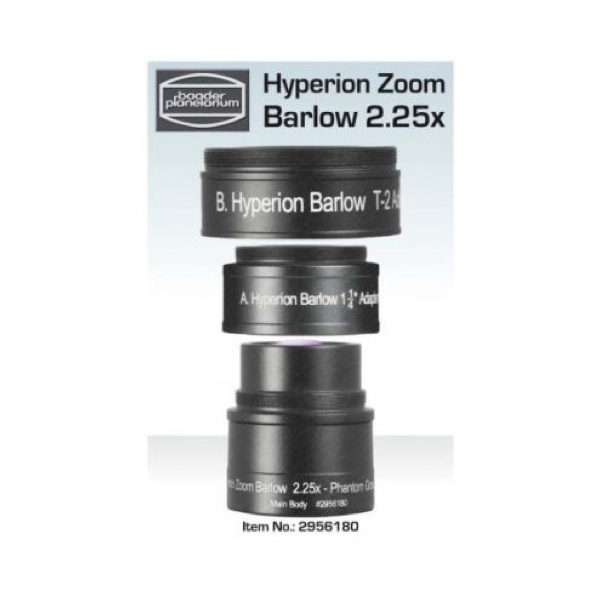 The Zoom barlow quickly attaches directly to your Hyperion zoom, in dual 2" or 1.25" configuration the image quality truly is astonishing. • Baader Phantom Group Coatings on all air-glass surfaces. • Threaded for standard 1¼" filters. • Includes all adapters needed to couple to any 1¼" filter thread. Enables attachment to practically any 1¼" Eyepiece for use as a classic APO barlow.